The ancient tradition of Inuit tattoos is seeing a modern revitalization. While some artists have gone modern, using tattoo guns, Holly Nordlum hand stitches or hand pokes the intricate Inuit designs. With her gloves, ink, needles and thread around her, Holly Mititquq Nordlum pierces the skin of her subject's wrist. "Your skin is tough as nails," she laughs with Madeleine Allakariallak, the host of CBC North's daily Inuktitut TV news program, Igalaaq, who is getting a new wrist tattoo while at a gathering of Inuit in Alaska. "That's a good thing. You're in television, you have to have thick skin!" Watch Allakariallak get her tattoo and learn about the ancient art of Inuit tattoos. Nordlum is no regular tattoo artist. She practices the art of Inuit tattoos, which is called Kakinniit or Tunniit in Inuktitut. It's an ancient tradition that is seeing a modern revitalization. There is evidence dating back nearly 4,000 years of Inuit women from across the circumpolar Arctic — from Russia to Alaska — bearing facial tattoos. 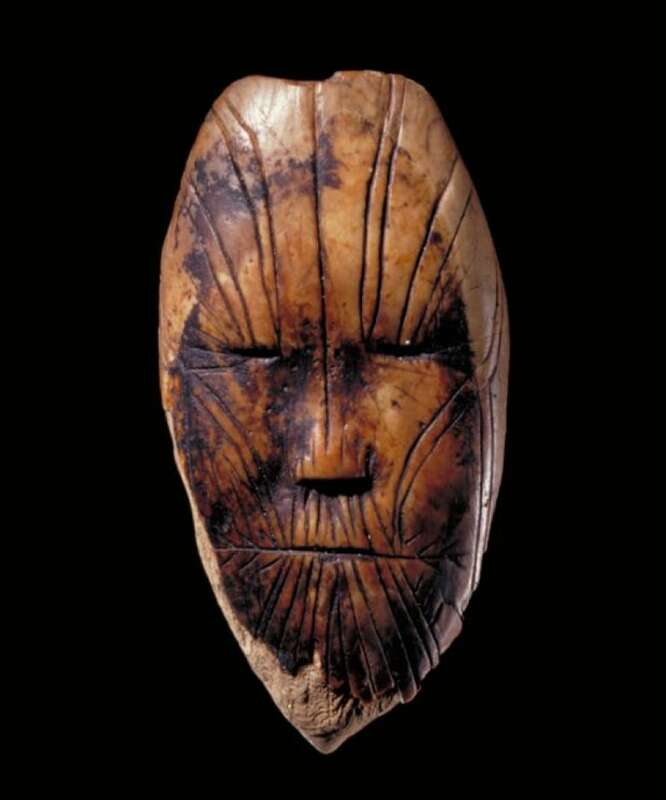 An ivory mask from Devon Island, Nunavut, shows what appear to be tattoo marks. It's dated back to 1700 B.C. The tattoos can also be inked on a woman's body, including her hands, wrists and shoulders. For some, it's simply a mark of beauty; for others, they represent significant milestones, such as marriage, children, or spiritual beliefs. "I do birds' feet every time I accomplish something. So I have them all over," Nordlum said. For Allakariallak, the lines represent family — her siblings. "The lines will continue, markings will be added," she said. Starting out, the first tattoo Nordlum did on herself was her inner thigh; she wanted to ink a tender spot so she understood the sensation her clients would experience when she poked them. While some artists have gone modern, using tattoo guns, Nordlum learned the traditional methods from a woman in Greenland over one month. She painstakingly hand pokes and hand stitches the intricate designs with a needle and cotton thread, which leave a trail of ink under a person's skin. Historically, artists used the urine of an old woman or a baby, she said. "This is the real way. This is how our ancestors really did it," Nordlum said, while stitching Allakariallak's skin. "No urine in this one!" Nordlum is from a small Inupiat village in Alaska, near the Arctic Circle. For nearly 20 years she's lived in Anchorage, where suicide rates are high. Domestic abuse, along with drug and alcohol abuse, are also widespread. Nordlum's project to revitalize traditional tattoos is an attempt to bring something positive to her people. "I wanted to do something for my own community," she said. "I'd been thinking a long time about how to reach younger people, how to make them aware and proud of who they are. I do a lot of work in schools with native kids in the city. "This is about healing — healing from colonization. Colonization was devastating to our people and we all suffer from that," she said. Associated with shamanism and seen as evil, Inuit tattoos were forbidden by Christian missionaries a century ago. 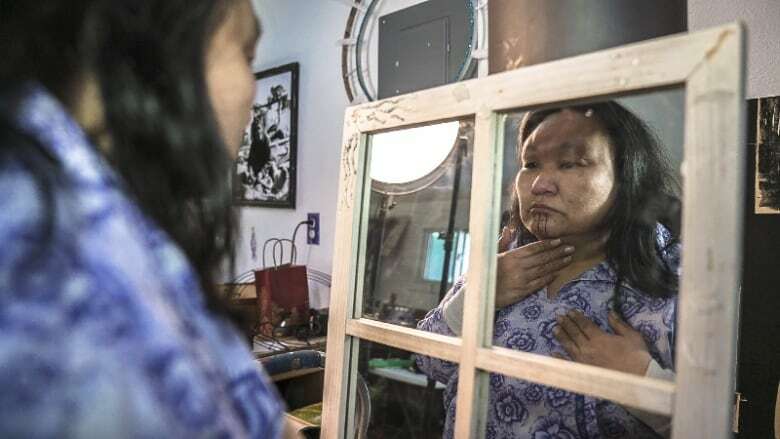 While its resurgence appears to be thriving, those suspicions still exist, which was evident when Nordlum received her traditional chin tattoo — tavluġun in Inupiat — about three years ago. "I started crying, just cause it was so hurtful," she said. "It was really scary. I was like, 'Wow if my own people are going to do that, what are other people going to do?'" Nordlum eventually came to the conclusion that the man's response had nothing to do with her. "That was his own history talking. I should've turned around and hugged him. 'Cause it was that bad for him." Nordlum has tattooed men with designs of artifacts or hunting — things that speak to them. Historically, only whaling captains or male leaders were inked, she said, but added that it's important to "bring our men in" and help them feel connected to their culture. But certain designs are for women only. "The traditional tattoos are about women's lives. The tattoos were by women, for women," she said. Nordlum said it's about regaining their history and ancestry, which also means some designs must stay exclusive to her people. "I will tattoo anyone. But these patterns, and the stitching, are just for Inuit." Working one on one with women has been an emotional journey for Nordlum. "The first year, I cried through the whole year. It's just so emotional," she said. "Something about poking the skin opens up emotional doors." 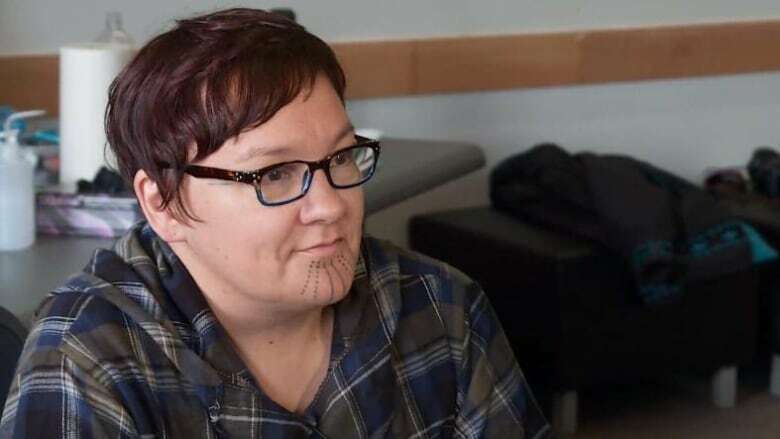 Nordlum said women often tell her that they feel like it's their fault that they didn't grow up in their Inuit or Inupiat village or with their blood family. She said their discussions are about healing. "Many women have never told their story, of like their Inukness, or not feeling enough." Getting her own family to open up about their past has been a struggle. She learned something about her mother while tattooing her finger. "She was so afraid of needles from boarding school, when they had all the boys and girls line up and give them all shots, or all had dentists pull teeth," Nordlum said. "That whole generation is scared of doctors and needles. That's something I did not expect that I would find. "It makes me so sad." While the stories can be difficult to hear, she repeatedly calls the connection with women "amazing." Nordlum recently tattooed an elder in her 70s. She said the woman had been waiting 60 years for the tattoo, which was her great-grandmother's design. "She was so happy! She was like bouncing around!" she laughs. "It's powerful with identity and celebration of culture." The revitalization movement for Kakinniit and Tunniit is going strong in Alaska, Greenland and Canada. Nordlum intends to go to Russia, where she said traditional tattoos are a thing of the past. Asked why she's going, she frankly says "to bring it back." "It's a special, special time."